In March 2001, the wrestling world changed forever. Countless of fans opened up their dial-up internet, only to be greeted with the most shocking news in wrestling: the WWF had bought WCW. Buying ECW not long after, this brought a definitive end to the Monday Night Wars, and for the first time, left the WWF as the sole major promotion in the United States. 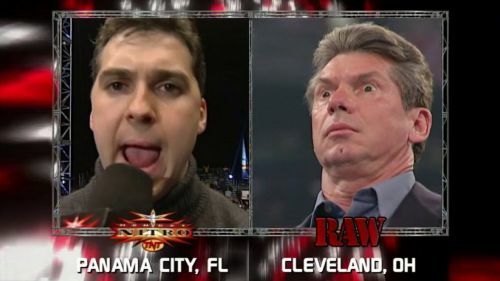 On March 26, WCW hosted their final Monday Nitro, a celebration of the historic company's past, with plenty of new-owner Vince McMahon thrown in for good measure. A bizarre night for all involved, McMahon had finally conquered his foes and was able to run WCW how he wanted. Despite being such a historic night, the show itself is still shrouded in mystery. Here are five things you (probably) didn't know about the final episode of WCW Monday Nitro. Everyone knew WCW was doing poorly, but few expected something like this to happen. Sure, the company was doing bad, thanks to a mix of egos, bad writing, and no-one in firm control, but surely, they'd bounce back, right? They always do. This belief was crushed, when Shane McMahon walked into the venue, not as an invader or in any disguise, but as a representative of the WWF, and their new employer. Arguably the least ruthless of the McMahons, Shane O'Mac promised that the WWF would keep WCW alive, and run shows such as Nitro and Thunder, though under the WWF banner. The truth is that this was just one of several ideas being thrown around about the future of the company, and after a dreadful WCW Title match on RAW later that year, it was killed.